Switching to a new computer, I had to export my WiFi profiles (network and passwords) and import them again on the new computer. This will create a number of XML files in the current directory, one file for each WLAN profile. You can copy the folder over to your new computer now. forfiles /c "netsh netsh wlan add profile filename=\"\""@file\"\"""
This will import all your WLAN profiles again. You can delete the folder with the XML files now. That’s it! Okay guys, the first RM2k3 update is out, v1.10a! It’s only a “quick fix” release, addressing the most pressing issues. Some of these fixes will later be improved once more (such as the fullscreen and the installer). Also, I talked with Degica about the patching/modding issue, and there will be modifications to the EULA, and a special “patch EULA” will be created soon. I can’t go into details yet, but I think you are going to like it. Degica has now, by order of KADOKAWA GAMES/Enterbrain and in cooperation with me, finally released an official English version of RPG Maker 2003 on Steam. At this point I would like to give a big thanks to Archeia who put a lot of sweat and blood into this translation as well. It should also be available on rpgmakerweb directly. This finally officially allows creating commercial games with RPG Maker 2003 (after a registration). Fortunately, the license also doesn’t have any clause preventing modifications, e.g. through the use of patches. However, the reverse engineering itself is still prohibited. EDIT: This may be incorrect. Please wait for an official statement and remember that I do not represent any of the companies involved. There is also an official English RTP. Although it has the same content as the existing inofficial one, it has different filenames; but no worries, you can have both RTPs installed alongside each other. * The fullscreen work properly, also on newer devices. ** Its look and labels have been aligned with RMVXA – with colors and partly more information in the list than previously. ** It has a horizontal scrollbar, can copy events as text and loads large events faster. ** It’s possible to copy event all commands between battle events and map/common events (although it will show a warning, because they still can’t be modified while being in the “wrong” place). * The help file now also works on Windows Vista/7/8. * Maps can’t get lost that easily anymore when a PC Cleaner is used. * Multiple instances can be opened at the same time, and you can create direct shortcuts to projects in Windows Explorer. * You have 1000 pictures, 100 labels and 9999 switches/variables/etc. * Picture commands also work while a message is displayed. * The fonts are now directly integrated into the engine and don’t need to be installed by the player. Unfortunately the source code was lost over time. Therefore, it was a bit difficult to implement the real “killer features”. Also, I originally planned to include all the bugfixes from DynRPG as well, and I wanted to integrate the CommonThisEventPatch, but there was not enough time. There will be updates, though. The FAQ page was very out-of-date and was now updated! Last time I gave you a little overview about the inner workings of RPG Maker 2009 Ultimate. This time, I’ll tell you more about the mysterious vclxchg5.dll/vclxchg6.dll files. Subclassing of windows in order to catch certain messages and react on them (modifying a window after it was created, reacting on a click on one of my toolbar buttons, etc.). Windows Hooks in order to process hotkeys and detect creation of windows (so as to be able to subclass them). 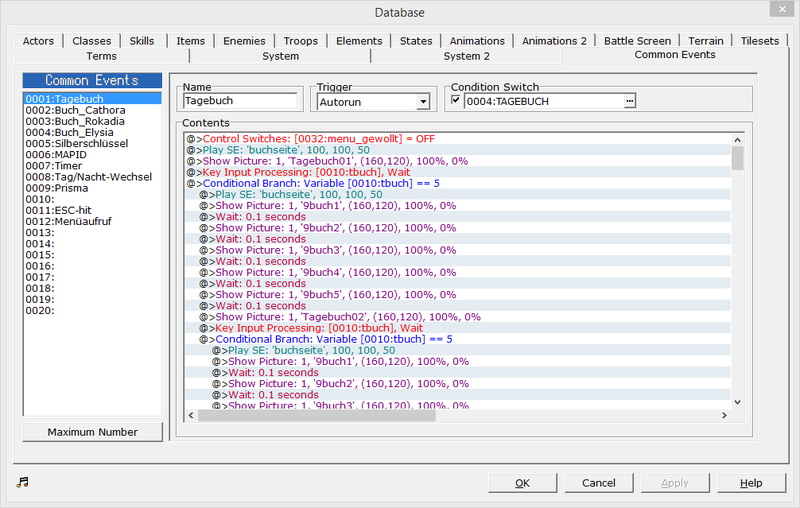 Function hooking using Microsoft Detours in order to manipulate behaviour of both internal RPG Maker functions (e.g. the function which is responsible for adding the resource files to the resource selector listboxes) and Windows API functions (e.g. CreateFontIndirectA for the font replacement feature). However, there was one big problem: Even though basic manipulation of windows (hiding, moving, resizing, changing labels, …) was no problem (possible using simple WinAPI), more advanced tasks (calling internal functions in order to simulate menu item clicks, changing listbox contents, changing the status bar, …) didn’t work that way. RTTI only works from within Delphi (furthermore, it is not very well documented). Not all of the fields/methods are accessible using RTTI. For some tasks, I also need to create, use and destroy Delphi objects (e.g. TString objects, to begin with). I am mostly working with HWNDs (WinAPI window handles), but in order to access Delphi’s properties, I need pointers to the corresponding TWinControl objects of Delphi. Fortunately, problem #4 is not very hard to solve. Upon inspection of the RPG Maker’s windows using Winspector Spy, I noticed that every control has a window property like “ControlOfs00400000000004D8″ with a pointer as value. A little googling revealed that this is in fact a pointer to the corresponding Delphi object and that the name of the property consists of “ControlOfs” followed by 8 characters representing the hexadecimal HINSTANCE of the control and another 8 characters representing the hexadecimal thread ID of the thread which created it. Problems #1, #2 and #3 all resulted from the fact that I am not using Delphi. Actually, it wouldn’t even have helped if I would have switched to Delphi at all, because the memory layout of the internal objects is different in every Delphi version. Therefore, I would have to use the same Delphi version as the RPG Maker was created with. This introduces a new problem, because RPG Maker 2000 was created with Delphi 5 while RPG Maker 2003 was created with Delphi 6. The solution in this case was to get Delphi 5 and Delphi 6, create a “translator” library which helps me communicating with Delphi (actually the VCL – the Visual Component Library), and compile the same library with both Delphi versions, but to two different files. The vclxchg5.dll and vclxchg6.dll files were born – VCLXChg stands for “VCL Exchange”. Both files are based upon the same source code, but compiled with different Delphi versions (5 and 6). Depending on which RPG Maker version is used, a different VCLXChg version is loaded. These libraries expose several functions which use Delphi objects in simple exported functions which I can use from FreeBasic, from simple string creation/deletion functions over a function to undock controls from their parent window (together with DockWnd.dll used for the floating tool panel) to RTTI functions. If you are interested in Delphi’s RTTI, have a look at this article. Also, if you press the Pause/Break key in RPG Maker 2009 Ultimate when debug mode is activated, this will call up the “Inspector” (which is written in Delphi inside the VCLXChg libraries) which allows you to explore the RTTI of the RPG Maker’s window objects. The UIMod feature also works using the RTTI. I had one problem, however: When I used my VCLXChg library more often (especially when strings (TString) and other objects like TStringList got involved), RPG Maker would suddenly crash with mysterious “Invalid pointer operation” and “Access violation” errors. A little bit of Google research revealed that each module (the main EXE file as well as every loaded DLL is a module) would have its own “memory manager” which handles creation and destruction of objects. This would explain my problems: I had, for example, created a TString in my VCLXChg library and set a window property to this string, which caused the main EXE of the RPG Maker to crash when it tried to destroy my string later (since it did belong to another module). The “normal” solution would be using the “SharedMem” package for Delphi in both the main module and the DLL, but this was impossible here because I didn’t have control over the main module – after all, I couldn’t just write an email to Enterbrain asking them to recompile the RPG Maker with SharedMem enabled so my modifications would work! After more digging around I found the SetMemoryManager function, which I could use to set the vclxchgX.dll’s memory manager to the RPG Maker’s. However, the problem was that I didn’t have the pointer to the RPG Maker’s TMemoryManager object! And I couldn’t call GetMemoryManager because the RPG Maker would have to call it, not me (we are back at writing emails to Enterbrain at this point)! I used a disassembler to find a function at which the TMemoryManager pointer is hardcoded (by compiling a file which uses GetMemoryManager and then looking at the assembly output) and created a search pattern from it so that I would find the same function (and thus the pointer to the TMemoryManager) in the RPG Maker. That’s it for today! Next time, we will look at how the injection of my code when the RPG Maker is started actually works (and how I make the RPG Maker load the right project).